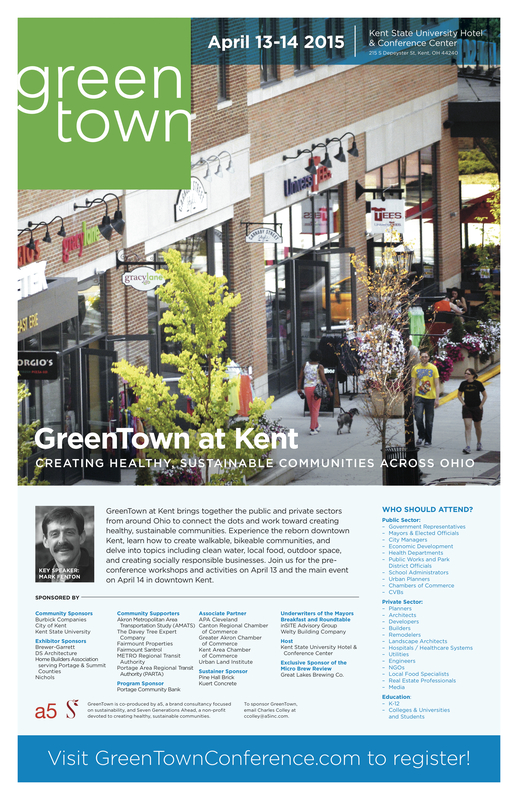 As introduced in my last post from February, the GreenTown conference will be held on April 14 at the Kent State Universtiy Hotel and Conference Center. Here are some updates on the events that will be offered: On April 13 there will be a pre-conference including three workshops: The “Farm to School” workshop will focus on the possibilities of increasing the capacity of local communities to provide locally produced foods in schools. After that, the “Towns and Growns” workshop will be held bringing together leaders form universities, municipalities, community non-profits and other individuals to think differently with the context of university-city collaborations. In the evening a walk through downtown Kent with key speaker Mark Fenton is being offered. The main event on April 14 will start with several presentations dealing with topics such as sustainable minded businesses, creating sustainable regions and walkable communities for healthy people. This will be followed by 4 breakout sessions beginning at 11 am. For these sessions one can choose from one out of five tracks which are: Economic development, food and waste, water and green infrastructure, community sustainability planning and transportation. One of the breakout sessions will be a panel discussion titled “Biomimicry: Innovation comes naturally.” Panelists include three of our biomimicry fellows (Emily Kennedy, Adam Pierce and Sebastian Engelhardt). For more information have a look at GreenTown at Kent. Registration for the event is now open. On April 14 the GreenTown conference will be hosted at the Kent State University Hotel and Conference Center. The conference will focus on the creation of healthy and sustainable communities addressing topics such as walkable and bikeable communities, clean water, local food, outdoor space, and creating socially responsible businesses. Pre-conference workshops and activities are offered on April 13. One of the breakout sessions during the main event on April 14 will be a panel discussion titled “Biomimicry: Innovation comes naturally.” Panelists include three of our biomimicry fellows (Emily Kennedy, Adam Pierce and Sebastian Engelhardt). More information is available on the official website of GreenTown at Kent and updates will be posted as the date approaches. Registration for the event is now open. This weekend was incredibly exciting. Rarely is there a time where I desperately wish I could be somewhere, but this past weekend was one of them, where I would have loved to have participated in the world’s largest Climate Change march in New York City. Organizers were hesitant to give attendance predictions for the event, and rightfully so – hard to gauge something of this magnitude. In the end, estimates put 400,000 people, along with some of their dogs (you can check out twitter #caninesforclimate) who marched to the United Nations building in New York City Sunday, September 21, 2014. The marchers in NYC, along with numerous puppets, banners, protest signs, and the help of at least 20 marching bands made as much noise as possible along the two-mile route. New York wasn’t alone in this effort. Rather, it has been a global coordination, which involved 1,400 partner organizations, 300 college campuses, and 2,700 other climate-related activities in 158 countries, as cited in this NYT article. In Melbourne, Australia, where Prime Minister Tony Abbott has called climate change science “absolute crap” and since rolled back climate change policies during his recent tenure, 30,000 protestors showed up to march. 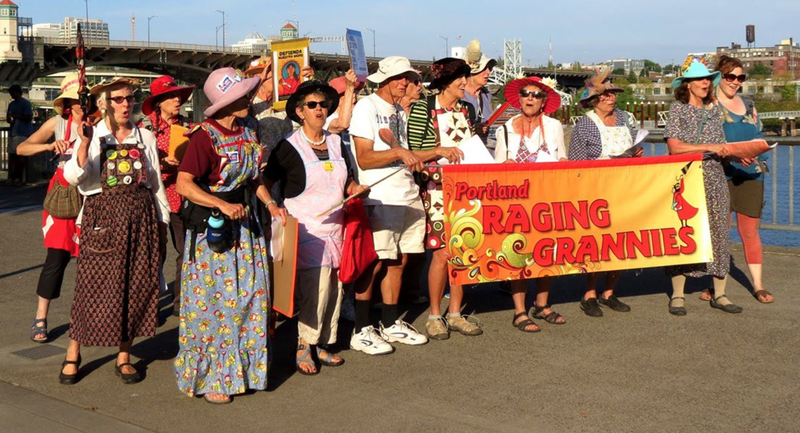 In Portland, Oregon, the Raging Grannies participated in the event, along with the highest demographic of teens and young adults. In an equally impressive stance, some of the countries with the most to lose with climate change also participated in solidarity, and with the help of social media, those Pacific Islands also were able to get their word out. Check out 350Pacific’s Facebook page to see many of the islands participating! 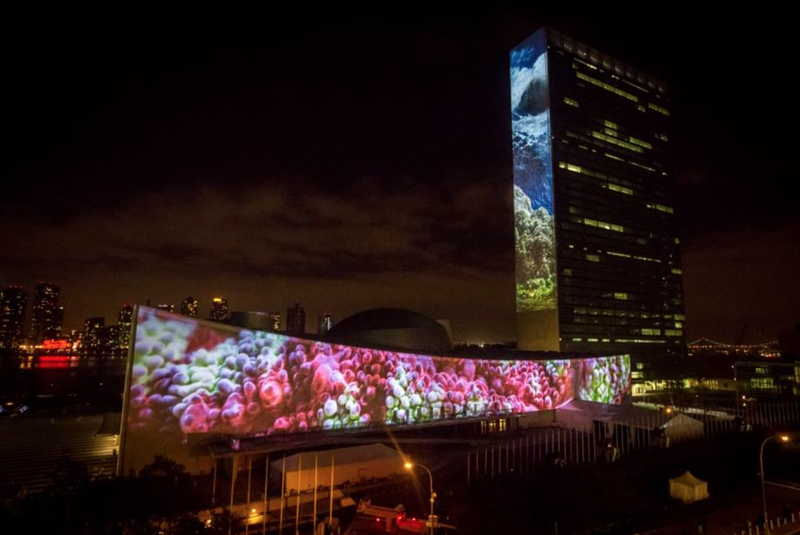 The night before the march (Saturday), thanks in part to Oscar winner Louie Psihoyos, he and others helped organize “illUmiNations”, where the UN building became illuminated with striking images of endangered species. The terrifying part is that it also included humans – environmental refugees – in the stunning display. 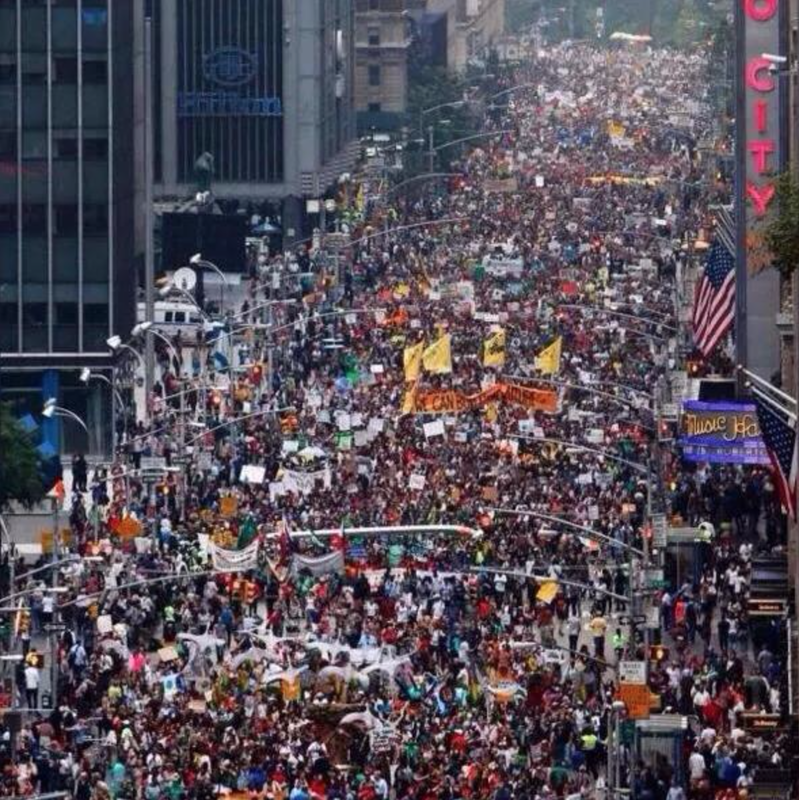 Clearly, the people want action, and with the UN Climate Summit starting on Tuesday, September 23, 2014, it’s set to be an exciting week. If the people truly have any influence, the climate change policy scales will be tipping in the right direction! 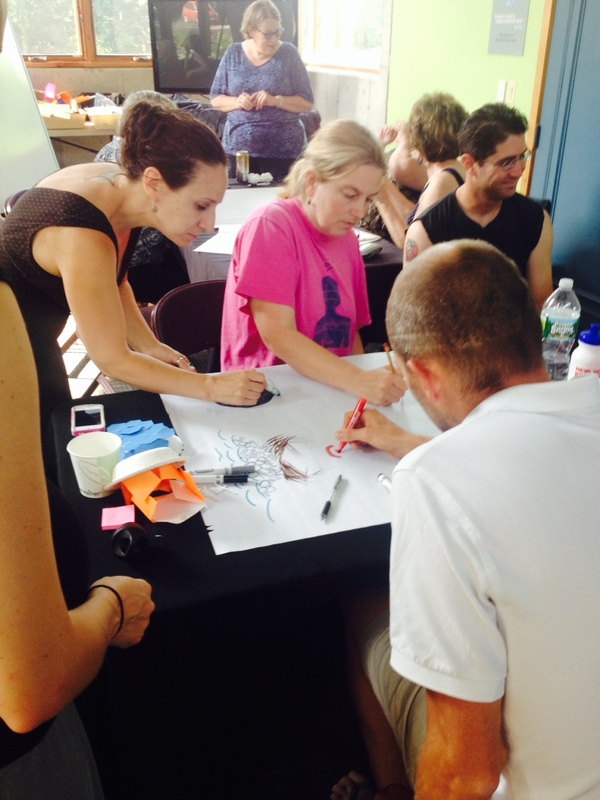 Continuing with the education theme from my past post, I’d like to highlight a great workshop I was able to participate in this summer, put on by BiomimicryNYC and sponsored by NYSERDA. 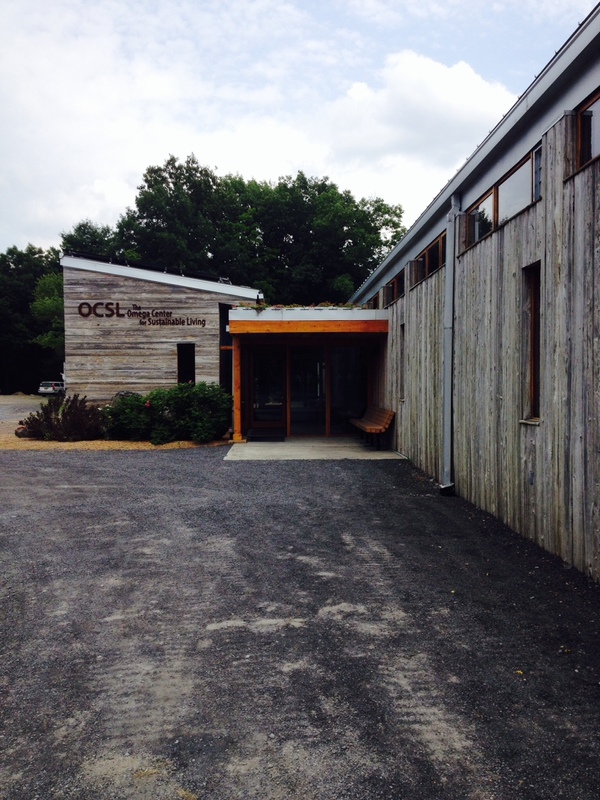 At this Biomimicry Workshop for Educators, hosted by the Omega Institute in Rhinebeck, NY, educators from all types of schools and grade levels came to learn how to integrate biomimicry into their own curriculum and lesson plans. The teachers ranged from Kindergarten educators, up through the undergraduate teaching level (mainly for education majors). I’m continuously struck by how many people hear about biomimicry and then have this intense desire to learn about it. Even through this course, one teacher learned about and was subsequently sponsored by a parent to go through this workshop because he could see the value in bringing it to the school. Yet another teacher’s catalyst was her own child, learning about biomimicry through her. 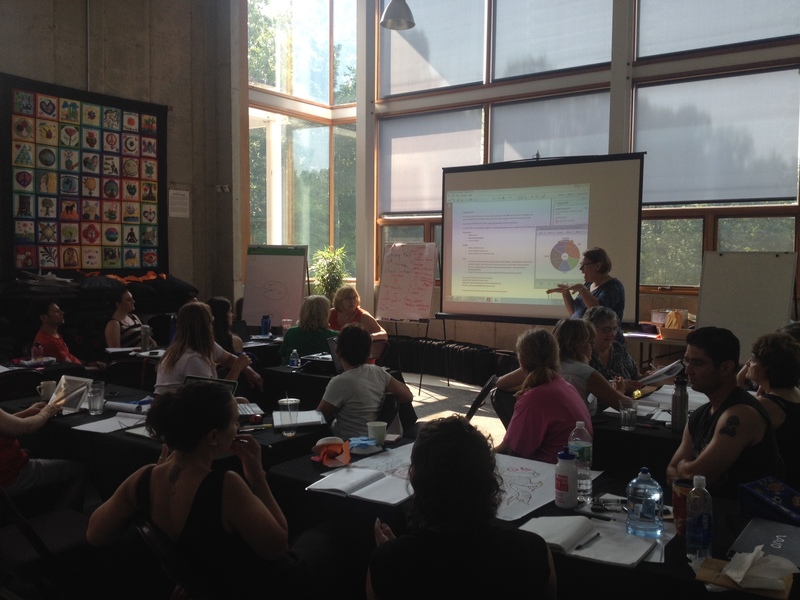 Learning about biomimicry and the workshop came from a number of different trajectories, but regardless of the start, we all came together to learn how to teach the next generation about this incredible new paradigm of thinking. Through the workshop, we tried out and experimented with various established lesson plans, but expanded beyond scientific biomimetic applications, to delve into the fictional realm – letting kids use their imaginations, blended with biomimicry tools and knowledge, to come up with something completely unique, such as….Mantis Shrimp Man! This lesson let kids (in this case – us big kids) create our own super heroes taking inspiration from unique abilities of organisms and systems. We then drew the super heroes and shared them with the rest of the class. What a great way to combine biomimicry, science, art and design, and public speaking skills into one lesson – a truly biomimetic, cross-disciplinary designed lesson! Below are a few photos of the many activities we dove into. 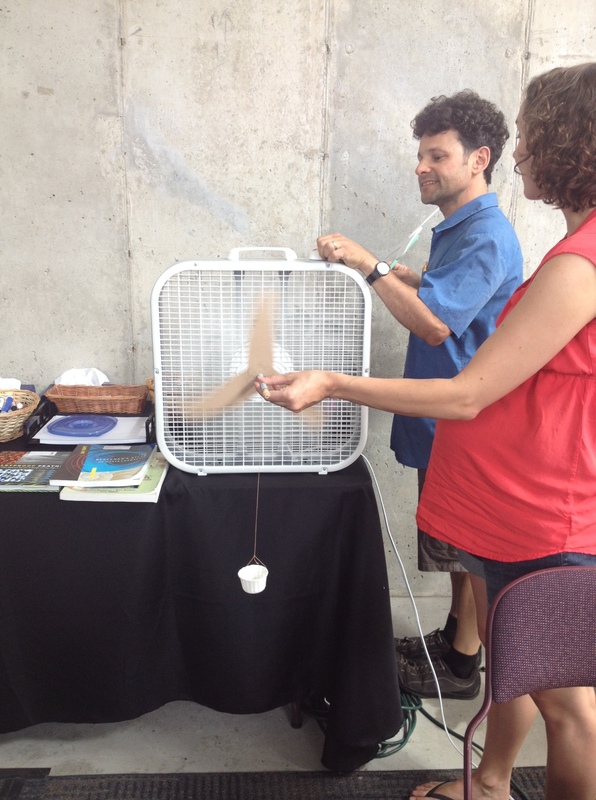 Last month I attended Biomimicry 3.8’s first ever Global Conference at UMass Boston. It was incredibly energizing to meet and exchange ideas with biomimicry practitioners from Canada, Mexico, Brazil, Argentina, Belgium, South Africa, and more. I hope to stay in touch with many! I sat in the conference ballroom for each plenary session, among hundreds of people reimagining our world through a biomimetic lens, and I felt with my whole being the power of our collective vision. We are willing a tremendous shift in design, and there is no stopping the type of willpower I encountered in Boston.